Follow these Steps to a Successful Main Street, (no matter its population, ethnic composition, location, income, or budget) - Michael D. Smith, Director of Real Estate, StreetSense creators of Vibrant Street Toolkit. Lots of opportunities to network! Bring your BIA/Neighbourhood Association to learn more! Lunchtime Meet and Greet Marketplace Talk to the innovators! Learn about alternative tenancies for small enterprise, business in the box (container conversions), micro markets, doing business in a park and much more. Lunch is included ~ pay what you can (donations gratefully accepted). 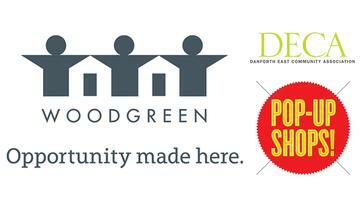 DECA/WoodGreen's successful Pop-up Shop program on Danforth East fills empty storefronts, gives entrepreneurs a great start, brings local shoppers out on the street and engages the community in the effort! The program has reduced the storefront vacancy rate to a healthy 9%, down from 17%.